inclusion of the Roma providing financial resources and acting as political instruments. Are you Roma and willing to study at a university? The conference “Creativity and Innovation in the Education of Children from Socially Disadvantaged Backgrounds” was organized by the Ministry of Education of the Slovak Republic with the support of the Office of the Government of the Slovak Republic and the Roma Education Fund (REF) in the framework of the Slovak Presidency of the Decade of Roma Inclusion. MEP, Ms.Barbara Lochbihler, form the Group of the Greens/European Free Alliance, a long-time activist in human rights visited the Roma Education Fund, in Budapest, Hungary 19 March 2011. The Annual General Meeting, also known as the AGM is the main decision-making body of International Erasmus Student Network . All the official sections of the network are invited to the AGM to decide about how the network should be run the following year. AGM this year takes place at Budapest and lasts for four days. Every year it is organized in a different city and country. The program begins on Thursday evening and the official meeting is scheduled for Friday, Saturday, and Sunday. The "Close to school"project in Romania, the Romaversitas Foundation in Hungary, and the DARTKE foundation in Hungary have been selected as finalists in the competition. The jury will select 30 projects out of the submitted 133 projects, from 11 countries. Information broadcasted on 25th February2011 on Channel Radio Belgrade 1 Romano Them - World Roma from 19.20 h.
Please, read the information about the project implemented by School Administration Belgrade and NGO "Little Prince", with the support of the Roma Education Fund. 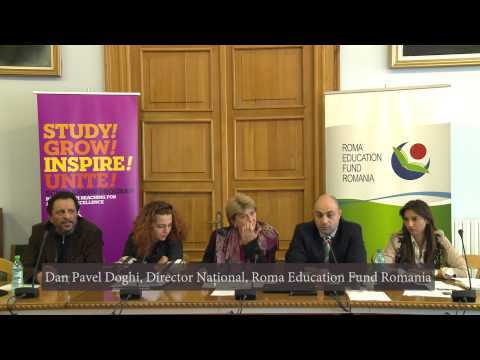 The audio was broadcast on Channel Radio Belgrade 1 Romano Them on the show - World of Roma, 24th February from 19.20 h.
For the World of Roma Nadja Kocic Rakocevic country facilitator of REF presented the program “Educational support program for Roma resettled from Gazela settlement”.